Where Has the Summer Gone and Where Have I Been? You would think summer would be the time when I am on point with my blogging but this summer has proved that theory wrong! Between vacations, a summer class, yoga, crossfit, running, enjoying the outside and now school starting, I have not had the time or desire to be glued to my iPad to type up posts. The week after the San Francisco Marathon, I was back on a plane heading to Wiscounsin for a family reunion! 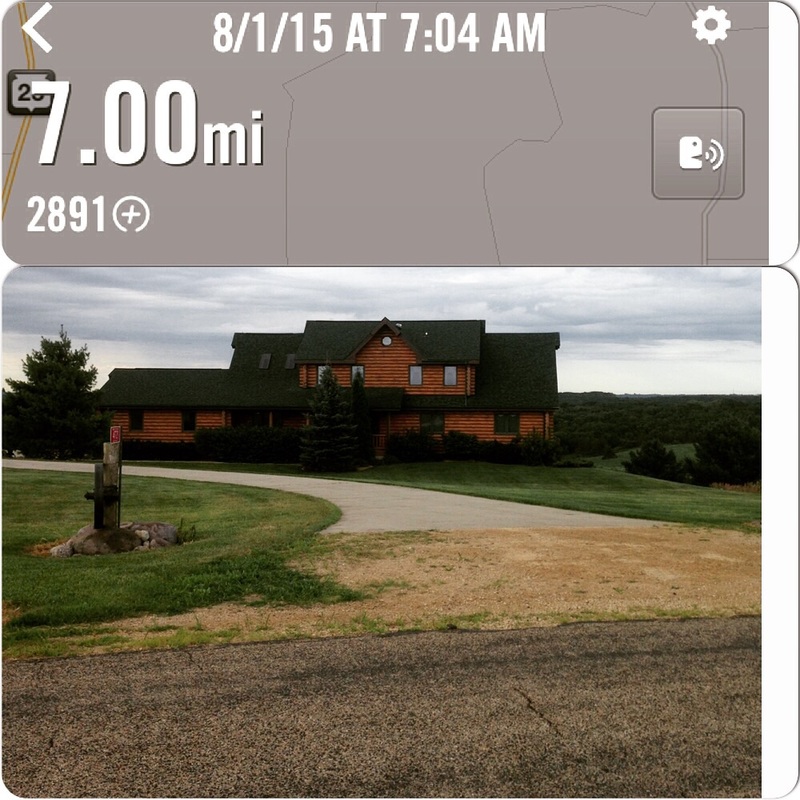 My first run back after taking some time off from running post-Marathon was a quiet 7-miler along a hilly road in Wiscounsin. Who knew Wiscounsin was so hilly! 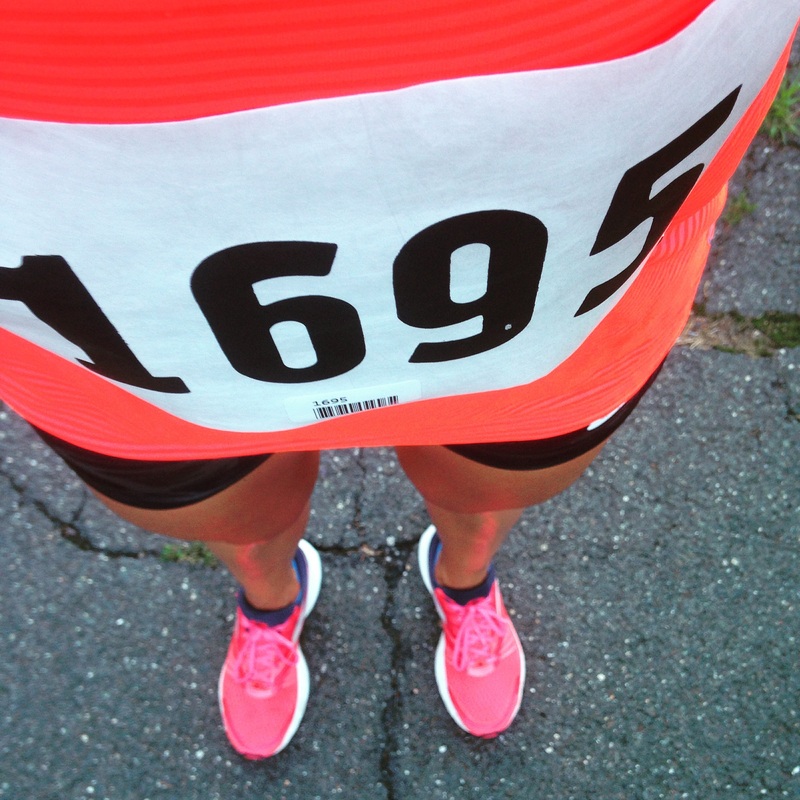 Another great memory from this summer (end of August) …MY FIRST RELAY! 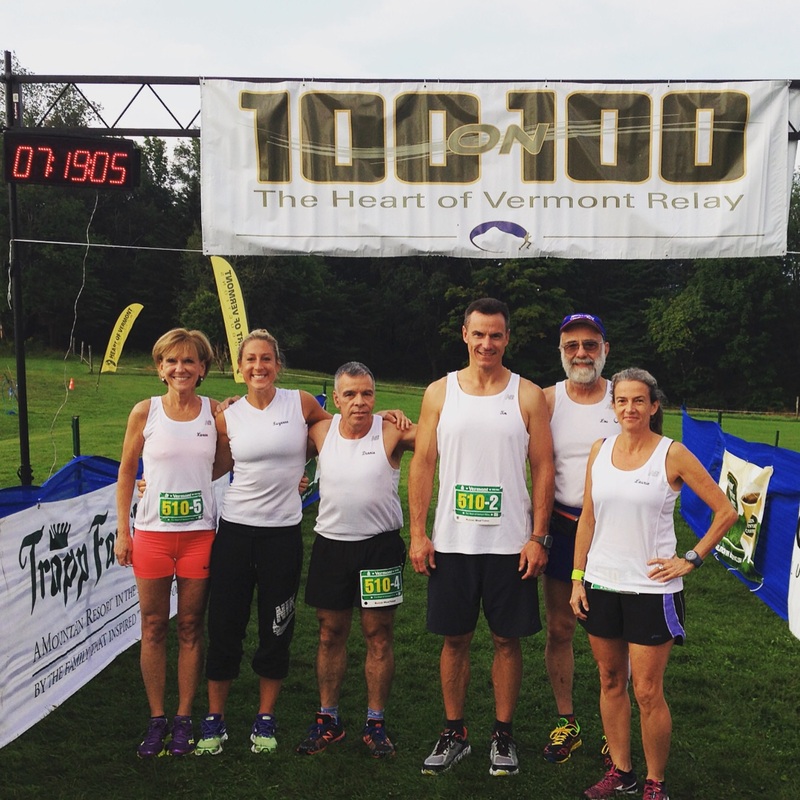 I did the 100 on 100 Vermont Relay which starts in Stowe, Vermont and finished right in Okemo. My mom was part of a team and one of the females was injured so I volunteered to take her spot. I had no idea what to expect but figured if I could run 26.2 then I could run my total of 16 throughout the day. Though it sounded logical and certainly manageable, I did not expect it to be as difficult and fun as it was! We stayed the night in Stowe and woke up early to make our 7am start time. And by our, I mean the woman who was doing our first leg. I was the last leg so I didn’t start until 11ish. Right as a the sun was starting to beam. Lovely. My first leg was 5.8 miles, my second leg was 5.2 miles and my third leg was 4.8 miles. It is safe to say that I experienced all the climate changes throughout the day. It began to downpour during my second leg which actually made me concentrate less on how miserable I was and more on just trying to hurry up and get out of the rain. Leg 2 was definitely the most challenging. People said that leg 2 is where you loosen up but it was the exact opposite for me. This is where I felt the tightest. Thankfully the rain gave me the kick I needed to finish up the final 2 miles. Leg 3 was actually my favorite! 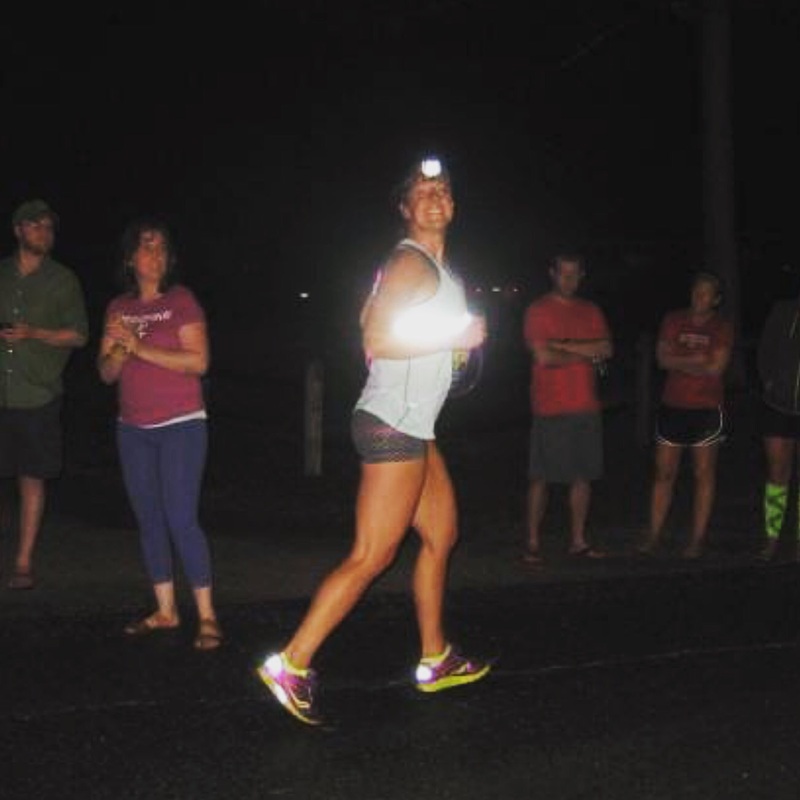 I never run at night or with a headlamp or through trails so this leg was pretty exciting. I quickly found out that the headlamp does not replace a street light. I had very little light and the trail-type road was not helping with the struggle. As much as I would have liked to move faster – not spraining an ankle took some priority and I just focused on my stepping. Around mile 3 I met up with a runner and we decided that if we wanted to finish this thing with ankles still attached to our legs, it was best that we stay together and use some teamwork headlamp action. It worked perfectly and the miles (it was only 2 but after a long day, that seemed like a lot) just seemed to fly by as we were chatting. Before I knew it, we were approaching our final hill that led us right into the lodge. The buffet table was in the same area so it almost felt like I was running straight toward the buffet line…which isn’t a bad way to end a race. 😉 After a day of eating/drinking just electrolytes, gels, bananas and nuts, it felt great to have a real meal! Even if it was 11 o’clock at night. I have also finally made my way to local Thursday night 5ks. The races go on for 12 weeks and you accumulate points every time you race. The better you perform, the more points you get at each race, however, if you miss just one week, you miss out on the points and can drop significantly. Every year, I say I am going to start at the beginning and try to get the most points but once again, I don’t start until much later and have missed so many points that even my wins will not bring me up. Points aside, they have been nice Thursday night runs and every week I go into the race telling myself that I am just running for fun. I do Crossfit on Thursday mornings so my legs are never feeling race-ready but for some crazy reason, every time that gun goes off, my soreness goes away, I stay relaxed and manage to pace myself perfectly. And with great pacing and low stress, I have been getting some pretty solid times and have consistently been placing 2nd. They may not be PRs but it feels so good these days to pace myself and learn how to just run for fun with a little competitive edge. Last year, I would come to these races with a plan to win. I would start off crazy fast, hit a wall, and usually want to die by the last mile. I may have had better times but it wasn’t worth it. I think I stopped going after 3 weeks because that whole “feel like dying” thing was not really what I wanted to schedule into my Thursday evenings. 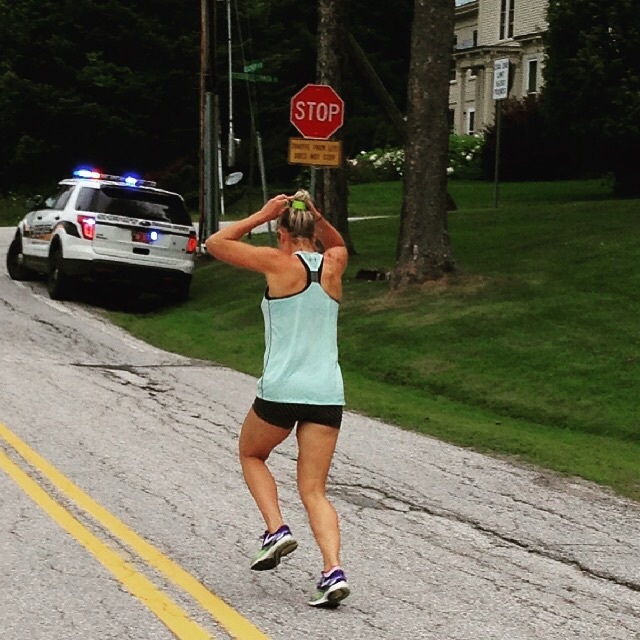 Now, I just start off with a solid pace, listen to my body, and start catching people if my body feels good. And with some good pacing, it usually does! 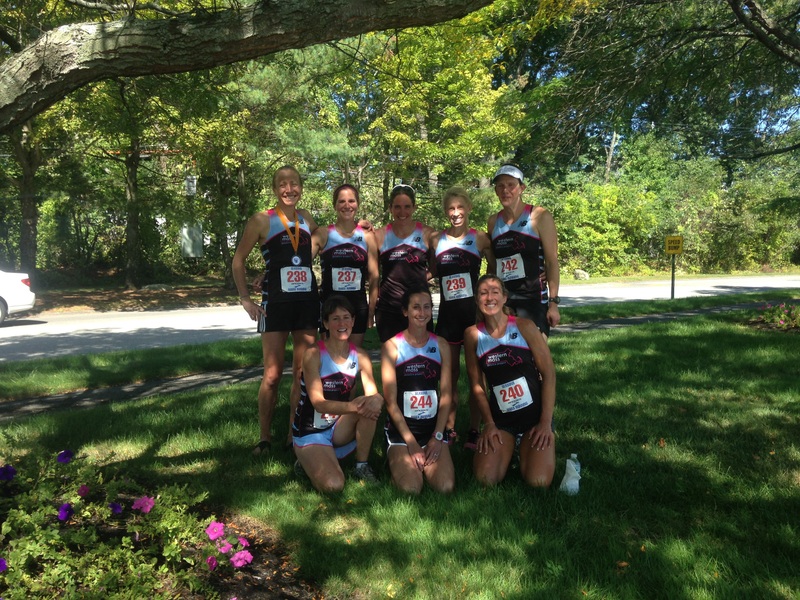 I also raced a 20k on Labor Day weekend. This race was a USATF certified race so I was racing for/with my team. I had a long run planned for that day prior to signing up so I figured I would make the haul to Eastern, MA so I can get a long run in with people, represent my team and enjoy the time with my team. We also bought new uniforms that are black, pink and baby blue so of course, I was eager to rock some of my favorite colors. So far this summer (and September), I have run 2 new PRs!! What is my strategy you ask??? 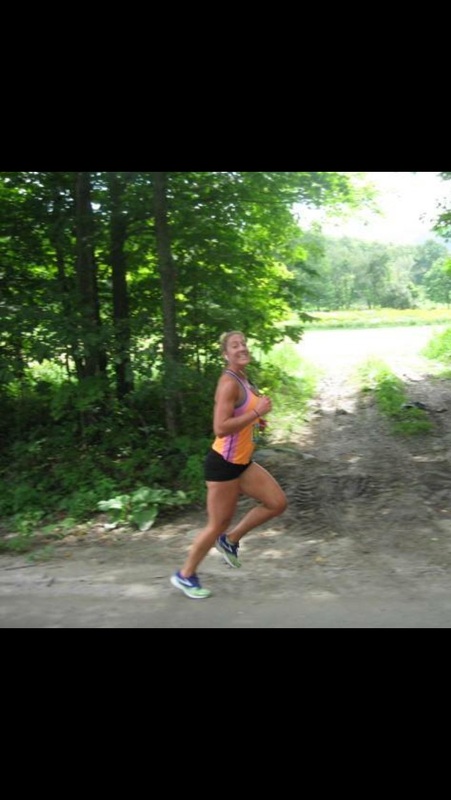 JUST RUN DISTANCES YOU HAVE NEVER RUN BEFORE! ha ha. But seriously, it is a sure way to score yourself a new PR. I bought a pair of Hokas because I just couldn’t resist the thought of how comfy they look despite the clown-shoe-like style. 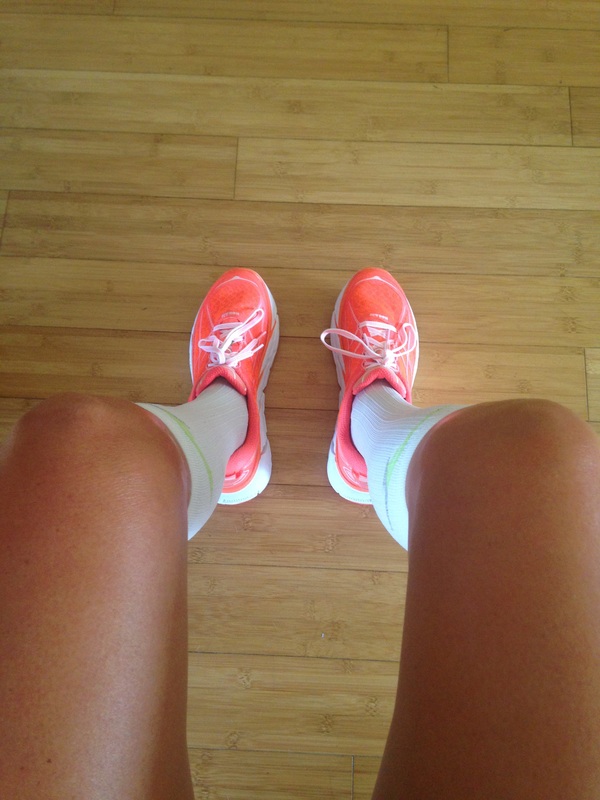 I am not sure why I thought breaking them in on a 14 mile run was wise, but of course, that was exactly what I did. They felt pretty good. I was not in love, but I am starting to warm-up to them. The weekend before school started, I went to Ithaca for a big family reunion/get-together with my boyfriend’s side of the family. 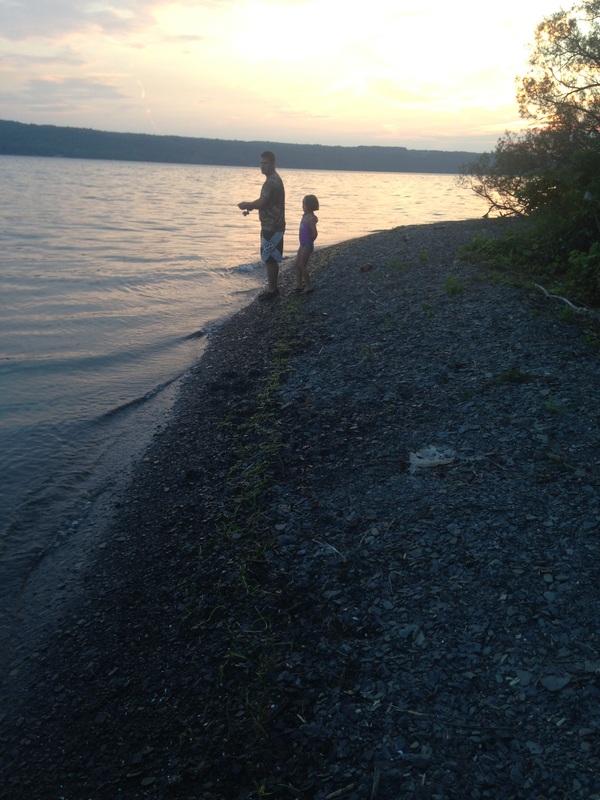 It was the absolute perfect way to end the summer. Good BBQs, good people, good weather, and lots of fun and games. Quick food recap. I bought the Oh She Glows cookbook and feel in love. I learned how to make creamy sauce by simply blending cashews that have been soaked and almond milk. 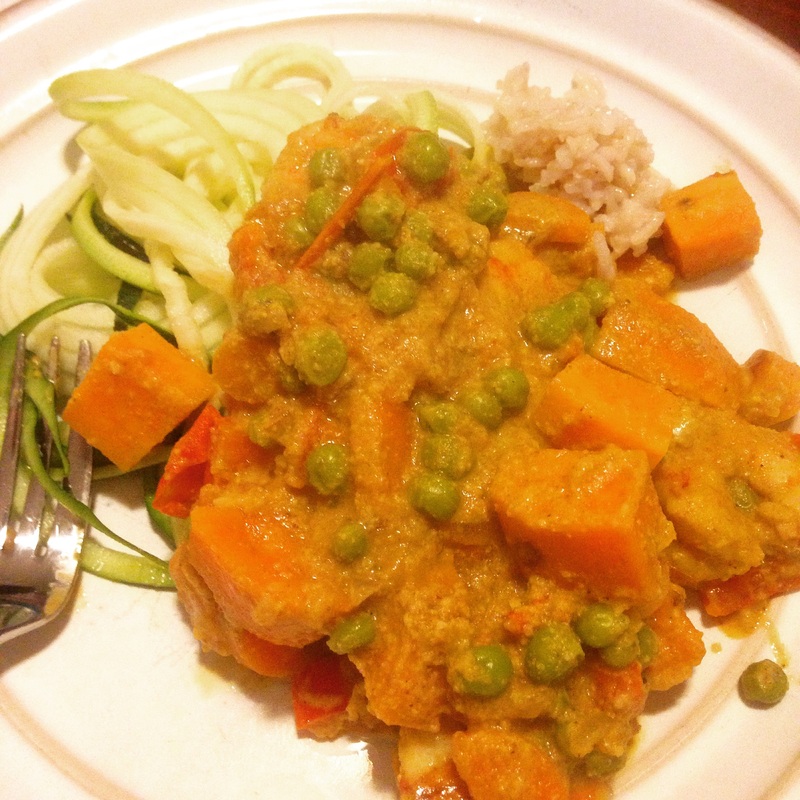 This dish was one of their curry dishes (we added the shrimp because it is a vegetarian cookbook) The sauce is simply curry, cashews and almond milk and it is mixed in with all sorts of delicious veggies. I topped some zoodles with this concoction but some brown rice would be perfect. 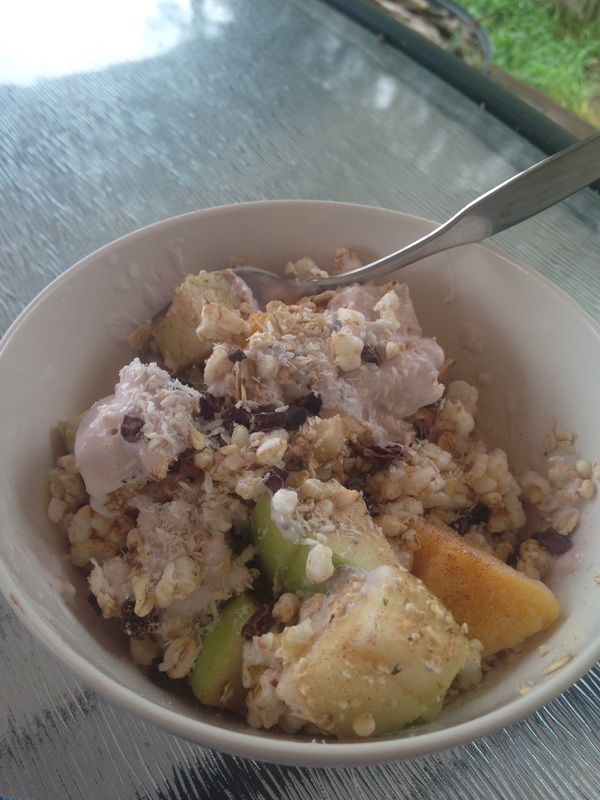 My mornings have consistently been delicious Greek yogurt and fruit bowls for the entire month. 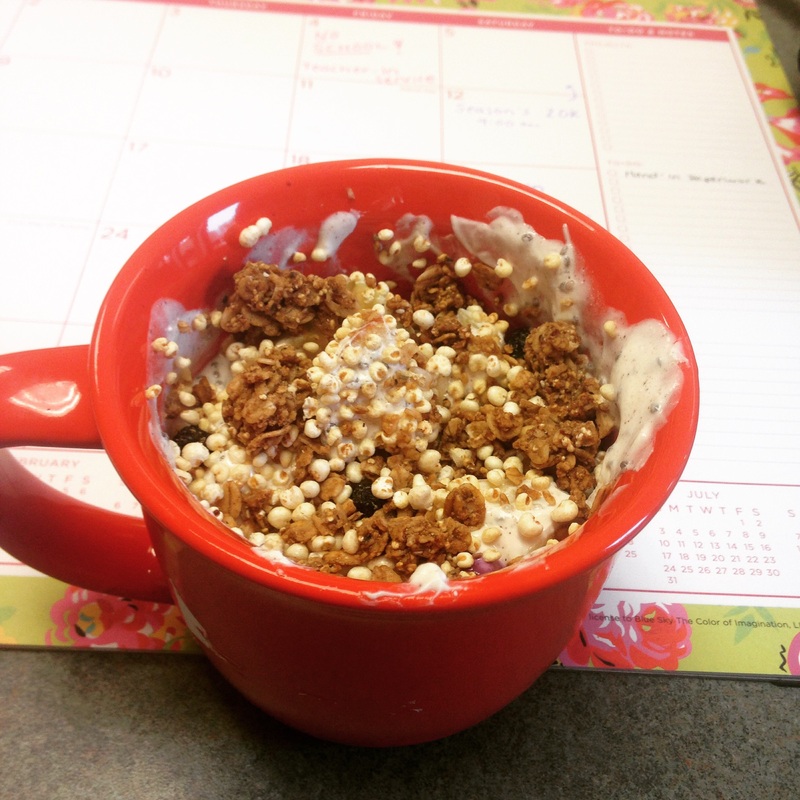 The key to a wonderful Greek yogurt bowl is some Purely Elizabeth Puffs + Granola. I absolutely love granola but the sugar content is pretty high. This cereal is primary puffs with some granola mixed in. It is perfect because you get just enough granola with some puffs for the added crunch. 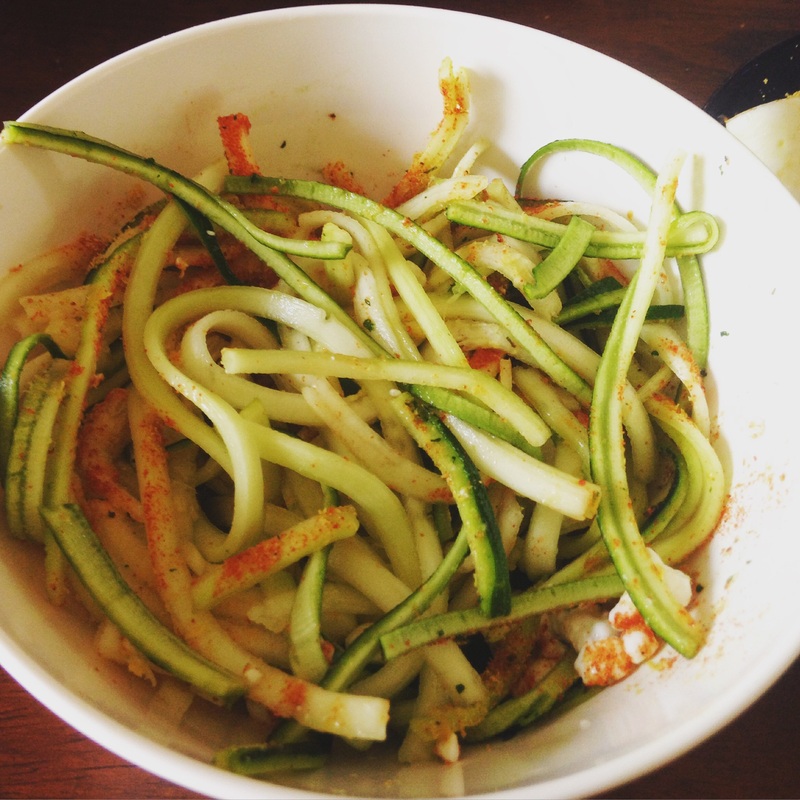 I have also been a huge fan on zoodles (Zucchini spiralized into noodles)! My summer lunch was usually zoodles mixed with Cottage Cheese and Flavor God Pizza seasoning. I hope everyone has had a great summer! It is always sad to see it go, but I love working with my new group of students and am excited to implement some new things in my teaching! Next postWhat exactly is a ‘Long Run’?